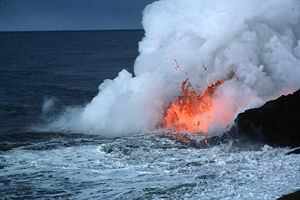 Lava flows from the Kīlauea volcano into the ocean on the island of Hawaii. Earth science (also known as the Earth Sciences, geoscience, or the geosciences) is an umbrella term for the sciences related to the planet Earth. The main disciplines within Earth science include geology, geodesy, geophysics, soil science, oceanography, hydrology, glaciology, and atmospheric sciences. These disciplines are oriented toward studying the various areas or "spheres" of the Earth system, such as the atmosphere, hydrosphere, lithosphere, and biosphere. Earth science is arguably a special case in planetary science, being the only known life-bearing planet. Given the numerous interactions between the Earth's spheres, many modern fields of earth science are formed with interdisciplinary approaches. Geology: This discipline is devoted to the study of the rocky parts of the Earth's crust (or lithosphere) and its historic development. Major subdisciplines are mineralogy and petrology, geochemistry, geomorphology, paleontology, stratigraphy, engineering geology, and sedimentology. Geodesy and Geophysics: Joined together in the International Union of Geodesy and Geophysics (IUGG), these disciplines investigate the figure (size and shape) of the Earth, its reaction to forces, and its potential fields, such as the magnetic and gravitational fields. Geophysicists also explore the Earth's core and mantle and the natural deposits, while geodesists study the movement of stars and satellites. Soil science: It involves studying the outermost layer of the Earth's crust that is subject to soil formation processes. This layer is known as the pedosphere. Major subdisciplines include edaphology (the study of the influence of soils on living things) and pedology (the study of soil formation, structure, and classification). Oceanography and Hydrology (including Limnology): They encompass studying the marine and freshwater domains of the Earth, which make up the hydrosphere. Major subdisciplines include hydrogeology and physical, chemical, and biological oceanography. Within the scientific union IUGG, these disciplines (except the chemical ones) are joined with geophysics. Glaciology: It covers the icy parts of the Earth, also known as the cryosphere. Atmospheric sciences: Meteorology, climatology, and aeronomy (physics and chemistry of the upper atmosphere) are the main subdisciplines of the atmospheric sciences. They cover the gaseous parts of the Earth, that is, the atmosphere, between the surface and the exosphere (at an altitude of about 1,000 kilometers). The above specialties do not operate in isolation. For example, to understand the circulation of the oceans, one must study the interactions between the ocean, atmosphere, and Earth's rotation. Other fields of research involve greater interdisciplinary interactions. Some of them are listed below. Biogeochemistry: It follows the cycling of elements through the spheres mediated by biological and geological processes, and especially their distribution and fluxes between reservoirs. Mineralogy and Mineral Physics: consider the rock-forming minerals on the atomic length-scale, both as part of geosystems and increasingly with an eye towards technological applications (for instance, as catalysts or exploiting their potential ferroelectric properties); in this, there is extensive and increasing overlap with solid-state physics, crystal chemistry and Materials Science. Paleoceanography and Paleoclimatology: They use the properties of sediments, ice cores, or biological material to infer past states of the ocean, atmosphere or climate. Meteorology: It describes, explains, and predicts the weather, based on the interaction of principally the ocean and atmosphere. Climatology: It describes and explains the climate in terms of the interaction of the litho-, pedo-, hydro-, atmo-, cryo-, and bio- spheres. Atmospheric chemistry: It describes, explains, and predicts the chemical composition of the atmosphere in principally terms of the interactions of the ocean, atmosphere, biosphere and human influence. Hydrology: It considers the flow of water through the Earth, from the transition of water in the form of precipitation in the atmosphere, to rivers, and groundwater in aquifers. Many scientists have begun using an approach known as Earth system science. They treat the entire Earth as a system in its own right, which develops as a result of positive and negative feedback between constituent systems. In the systems approach, scientists combine the use of computer models with global satellite and shipboard data, in attempting to understand the Earth's past and to predict its future behavior. Complex computer models that seek to model several different parts of the Earth system and the interactions between them are known as Earth system models. Many are based on Global climate models and include sub-models for the ocean, atmosphere, biosphere, and other parts of the Earth system. The interactions are of particular importance when trying to understand changes over decades, centuries, and longer periods. "Gaia theories" are formulated to explain the behavior of the Earth system in terms of the influence of the biosphere. ↑ The International Union of Geodesy and Geophysics (IUGG) is a nongovernmental organization dedicated to the scientific study of the Earth and to the application of the knowledge gained to the needs of society. It was established in 1919. Its scope includes environmental preservation, reduction of the effects of natural hazards, and mineral resources. This page was last modified on 9 September 2013, at 18:34.